14" x 17" x 6"
For a modern take on the iconic hardshell lawyer’s briefcase, we put our heads together and came up with our iconic Partner’s Brief. Bosca’s approach to design can be best classified as ‘tradition with a twist,’ and this piece is a shining example of that philosophy. We started with a classic design and refined it with some modern functionality – the shoulders have been sloped ever so slightly for a more elegant profile, while the interior has been adjusted to accommodate a laptop and more. The main compartment has been divided into three sections – the center reserved for a laptop or tablet, with front section designed with our signature organization suite baring plenty of pockets for your essentials. Visually, the richness of vegetable-tanned Old Leather makes each piece unique, as the leather grain varies from hide to hide. With plenty of space without creating a bulky appearance, this case is sleek, strong, and provides an artful interpretation of a proven winner. I have used the same briefcases made by Atlas of Boston (out of business) for years. When it came time to find a replacement, I was disappointed to find that there weren't many options for quality leather with a classic design until I found Bosca. I ordered the Large Partners Brief in black and I am glad I did. It shipped promptly, and the quality of this product makes it very well priced for what it is. I would highly recommend this bag for any professional that wants to impress, but also have a functional and durable piece for daily use and abuse. Briefcase looks and smells great! I can't wait to use it for work.! I have owned my Bosca brief case for over 10 years, every since I started my Private Investgation Agency. Looks good around attorneys, clients and other PIs. Tough as nails and I can easily stuff my laptop, binoculars , and case file in this bag and hit the streets in style. I was looking for a new briefcase with a classic yet modern design and in that process checked out dozens of manufacturer and websites. This is the one that immediately caught my eye. I had it monogrammed and shipped to Germany (which worked flawlessly) - it arrived today and it looks even better in real.What a fantastic briefcase! Its interior is very well thought-through with dedidated slots for everything important - which for me as a frequent traveller with constant panic attacks over losing one of my phones, keys, wallet is very important:) In general fantastic attention to detail and great craftmanship!Will buy this again should it ever wear out in a few years.Thanks for this product and the fast shipment! I have gone through several laptop bags and briefcases over the years but this is by far the best one I have owned yet. The internal organizational structure is excellent, I really like the tablet pocket behind the closet organizer and the leather is exquisite. After ordering it I was afraid it may be too bulky and definitely pricy but once I received it I was delighted to find it was the perfect size and well worth the cost. This was my first Bosca purchase and I can say this will not be my last. Bought this bag in Chicago in 1998. Two years later, the handle loosened up from the steel framework across the top; I carry an I-Pad and way too many reports in this briefcase. Sent bag into Bosca for repair and they quickly reinforced the handle to the top of the bag (stronger screws perhaps) -- just like new again. 16 years later, I am going to treat myself to another Bosca briefcase just like this one. 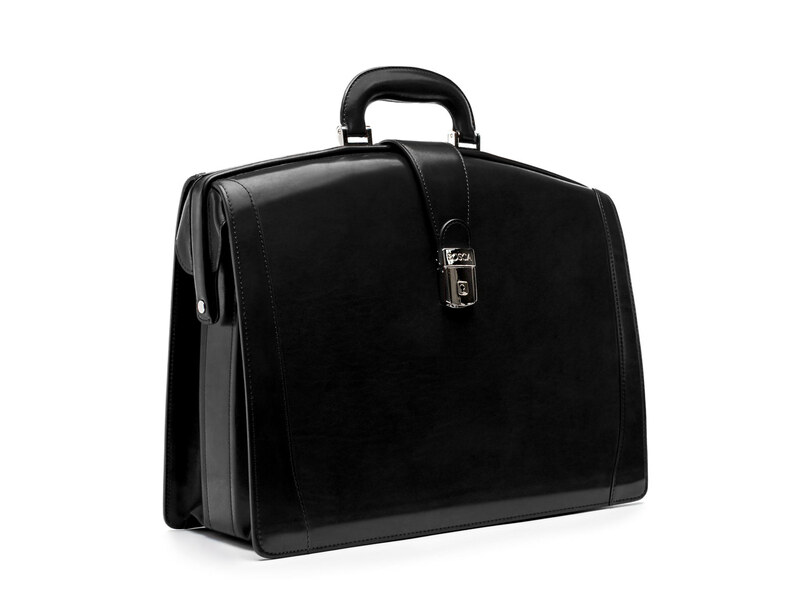 If you are looking for style, dependability, function and great service -- choose this briefcase -- you will "love" it! 18 years ago I paid $495 for this bag.....now I will gladly pay $625, most likely for the last time. Looks more beautiful than advertised. This handsome bag will be noticed by other lawyers. I received this as a gift and it is the best briefcase I have ever carried. The monogram gave it that special touch and I am asked on a weekly basis "where did you get this bag from". If you are looking to buy one please don't hesitate as this would be a great investment. This is the most beautiful thing I have ever purchased! It just took my breath away! Incredibly well-made of fine leather. Classy and pragmatic at the same time. I am so happy to have this to give to our son upon his law school graduation. 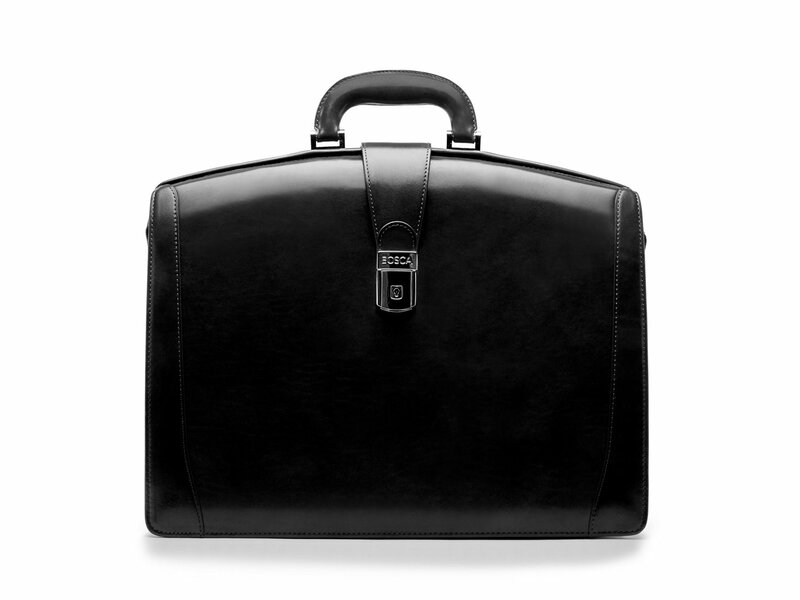 I wanted a Bosca partner's briefcase for years before I finally bought one. In the meantime I cheaper out and bought two other leather briefcases - neither of which lasted a year before breaking. So, I bit the bullet and bought a Bosca in 2006. After eight years of daily use, it is as good as new. Pictures do these thing no justice. They are great looking and they hold a LOT. I usually have my MacBook (in a sleeve) and two leather portfolios in the middle compartment. The side compartment without the organizer will hold several client files. I can get my iPad and all my cords, pens, exhibit stickers, and my digital recorder into the organizer side. Unless you're looking for one of those hard-sided catalogue cases, this is the last bag you will ever need. I put leather conditioner on mine once a year, and you would never know that it has seen almost a decade of hard use. I have been using a plethora of bags over the years trying to find what suits me. I've gone through everything from nylon zip-around bags to an all leather duffel, and I have to say this "partners brief" is by far best suited to my needs. Besides its more unique coloring (I chose the new amber stain color), the bags organizing compartments and gussets work perfectly for me. Inside my bag I keep the following: GUSSET 1 - padfolio and any "go to" papers I might need for the next meeting, MIDDLE - all the items I need to keep on hand for spare time (i.e. memos, briefing reports, newspaper articles, magazines), GUSSET 3 - this one is closest to the organizing compartment and I usually just use it for all my spare items, which right now include a few random cough drops, keys, wallet, pain reliever, tissue, etc. I keep this stuff here, because it is closest to the traditional BOSCA organizing compartment, which perfectly holds my two phones, three pens, my iPad, a few letters for mailing or bills I need to pay, business cards, and a couple other spare papers, depending on the day or time of year. All around the piece is great if you are looking for a traditional briefcase and don't mind that fact that is doesn't have a strap. The top opening is perfect and makes grabbing files from my brief during a meeting a win, if you don't already count its beautiful yet not too showy appearance as one. The reason I'm giving for stars is because I had to return my first purchase bag to a vendor because the outside buckle did not work properly. I thought it was a little hard to keep closed and then after watching some videos online and checking with the store, I learned that it should be much easier. The second time around proved much better and I haven't been disappointed yet. I use this case regularly to carry a bunch of books and documents to & from my home office. Great performing briefcase and is always the best looking compare to my colleagues! Now I want another lighter colour for the spring and summer! Fabulous case. This is perfect for all of my needs and my laptop fits right in the middle. My earlier partners brief had a pocket on the back that would accommodate my laptop, but I much prefer this one. The leather is amazing and the craftsmanship is astounding . I am hard on my brief cases and these are the only ones that can handle alll of my work and hold up. The finest briefcase I've ever had, extremely functional, high quality, have purchased a total of 3 over the last 10 to 12 years.... Easy to clean and polish!!! !